In previous years, entrants had been given more open-ended topics, such as “Get rich or die trying” and “Dear Mr. President,” but this year’s theme specifically called for students to give some “tough love” to a specific flaw that they saw as part cause of the current political, economic, or social crisis. Sophomore Donovan Bisbee, who had finished fifth in the previous year’s competition, won the contest with an energetic speech entitled “Don’t Make Me Turn This Nation Around!” Juniors Michael Nossett (“In Greed We Trust”) and Andrew Forrester (“Replacing America’s Priorities”) finished second and third, respectively, with speeches that criticized Americans’ selfishness while encouraging them to put more value on relationships and less on materialism. Rounding out the finalists were sophomores Trevor Counceller (“Re-imagining America for Success in the 21st Century”) who took fourth, and Grayson Swaim (“An Academic Default”). The competition began with Nossett admonishing the old capitalist adage that “Greed is good.” Instead, Nossett stated that greed rather works to consume people, citing those who are enslaved to mortgages that they can’t pay and others, such as CEOs and business owners, who have committed suicide because of depression over financial failings. In addition to speeches that emphasized selflessness needed, other contestants tackled more-specific concerns. Counceller implored America to regain its former work ethic and personal fiscal responsibility, and Swaim used his own positive and negative experiences in the American public school system to push for the needs of higher standards in education. Bisbee, however, stole the show with an extended simile of America as a spoiled child in desperate need of tough love. After marching to the podium, Bisbee immediately launched into a drill sergeant’s diatribe from Stanley Kubrick’s classic war film Full Metal Jacket. After capturing the audience’s attention with this rant that would likely be considered “tough,” but not necessarily “love,” Bisbee explained how the concepts of the two appear to be to diametrically opposed but possess a wide range of definitions. Despite examining nearly identical elements as some of the earlier contestants, such as the needs for improved education, a more responsible consumer culture without debt, and a respectful approach to dealing with other countries, Bisbee separated himself from the field through his use of simile. America, he said, was a spoiled child that skipped class and didn’t do its homework, wantonly spent its allowance as if it was endless, and refused to play well with others. After finishing fifth in last year’s competition, Bisbee said the added experience made the difference. “I feel like I just wasn’t really ready for it last year and I wasn’t really comfortable with my speech. This year I was a little bit more comfortable,” he said. Although he seemed confident in his delivery, Bisbee still felt particularly nervous before his speech. “Everyone said basically everything that was in my speech, but just not in the same way, so I thought, ‘How do I make this fresh without messing it up as I’m going?’,” said Bisbee, who admittedly had to ad-lib a bit more than he expected. The contest was judged by Professor of Religion Bill Cook ’66, the Honorable David Ault ’70, and Vasabjit Banerjee ’02, a current Ph. D. candidate at Indiana University. 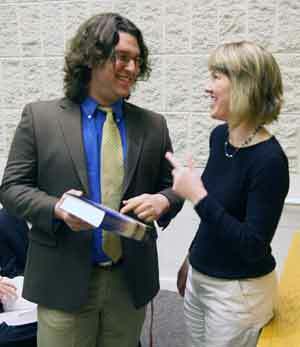 Each finalist received a copy of the complete works of Williams Shakespeare as well as a cash award. A gift from the late D.P. Baldwin endowed an award to be given each year to the three Wabash students who "compose and pronounce the best orations." The Baldwin Oratorical Contest is the oldest continuous public speaking contest west of the Alleghenies. Thus, each Spring the Wabash Rhetoric Department sponsors the Baldwin Oratorical Contest and determines the top three speakers.